An increasingly crowded world has spilled over into the Texas Southern High Plains, and the effects are contributing to population declines of a small bird that relies on the region’s saline lakes for survival. The snowy plover, a shorebird about six inches in length, uses regional saline lakes for nesting and as stopover habitats during migration. Drought, groundwater pumping for crop irrigation and increased rates of nest failures have all contributed to declines in this species during the past 15 years. Hannah Ashbaugh, an SFA environmental science graduate student from Flower Mound, is on a mission to pinpoint potential impacts that naturally occurring heavy metals and other agricultural contaminants may be having on the bird’s population. “The most recent Texas Southern High Plains snowy plover population study conducted from 1998 to 2009 indicates a population decline of approximately 75 percent,” Ashbaugh said. She adds snowy plovers are important because they are part of the interconnected web of life in these saline lake systems. The number of snowy plovers nesting and fledging young is an indicator of the overall health of these regionally rare wetland systems. Dr. Warren Conway, SFA professor of wildlife management, laid the foundation for Ashbaugh’s research in the 1990s. When Conway was working toward his doctorate in Lubbock, he began studying the bird’s nesting habits and population. Then, in 2009, Dr. Sarah Saalfeld completed her dissertation at SFA by elaborating on elements of Conway’s research. Conway later introduced Ashbaugh to the project. During the past several months, Ashbaugh has been living in Lubbock collecting data on snowy plovers at Mound, Rich and Tahoka lakes. She spends her time gathering sediment, insects, vegetation and other samples and observing snowy plover nesting activity along the shorelines. According to Ashbaugh, snowy plovers are ground nesters and breed on coastal or inland saline lakes on either sand or gravel near a freshwater source. The majority of their diet is brine flies, which swarm around the salty water. To keep their eggs cool during extreme temperatures that can reach nearly 130 degrees Fahrenheit on the salt flats, adults “belly soak.” Ashbaugh said the birds incubate their eggs by leaving a space between their bellies and the eggs to create an air pocket that allows for circulation. They submerge their bellies in the lake water to help cool the eggs. The Ogallala Aquifer, a vast, shallow water table located beneath the U.S. Great Plains, runs through this area and is a main source of water for humans and wildlife alike. The saline lakes are directly connected to the underlying aquifer and are considered a reflection of the aquifer’s water table. The freshwater springs from the aquifer feed the saline lakes. Extreme drought conditions throughout the region, along with crop irrigation, have caused a “draining” of the aquifer and saline lakes, which has a detrimental effect on the birds’ ability to nest. Additionally, the lack of water presence depletes the vegetation and insects. As the Ogallala Aquifer and salt lakes drain, the contaminants that naturally occur and those introduced by man may become more concentrated. Organisms and insects ingest these contaminants, and as the food chain goes higher, snowy plovers eat the insects and may ingest contaminated prey. Ashbaugh said at extreme concentrations this can result in the birds forgoing nesting, nest failure, embryo deformities, hatchling mortality, toxicosis and death. 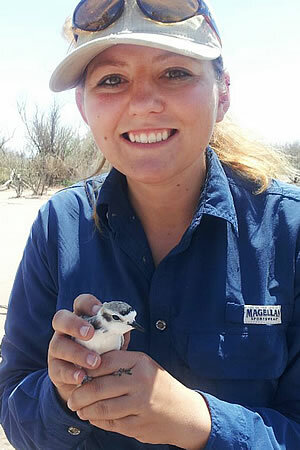 Although no direct linkages exist between declining snowy plover populations and environmental contaminants present in the Southern High Plains saline lakes, Ashbaugh said her research is designed to address this information gap. After graduation, Ashbaugh plans to work toward a doctorate in wildlife toxicology. “My research has created a deep love and passion for shorebirds, waterfowl and wildlife dependent upon wetland environments,” she said. By Donna Parish. This article is reprinted with permission from Sawdust, the magazine of Stephen F. Austin (SFA) State University. It is especially interesting to us at PLJV because it focuses on the Snowy Plover, one of our priority bird species that uses a high priority habitat type. Only a few saline lakes are found in the Great Plains, in the southwest Texas Panhandle and eastern New Mexico. They are spring-fed from the High Plains Aquifer. When the springs run dry, the saline lake disappears. As the Aquifer becomes depleted, and the springs subsequently dry up, we lose a unique component to the High Plains ecosystem and habitat that supports many species including the Snowy Plover. For more information about the research, contact Hannah Ashbaugh.